There’s no question that a boat can be a major investment. Depending on how often you’re out on the water, it’s going to need some regular care. Keep in mind that caring for and cleaning your boat not only maintains its value but also prevents against wear and tear. That said, occasionally hosing it down likely isn’t enough to get the job done. Keep reading for tips on how to give your boat the thorough cleaning it needs. Clean the carpet of your boat – In this guide from Bass Pro Shops, it’s mentioned that a boat’s carpet is most prone to dirt and grime. 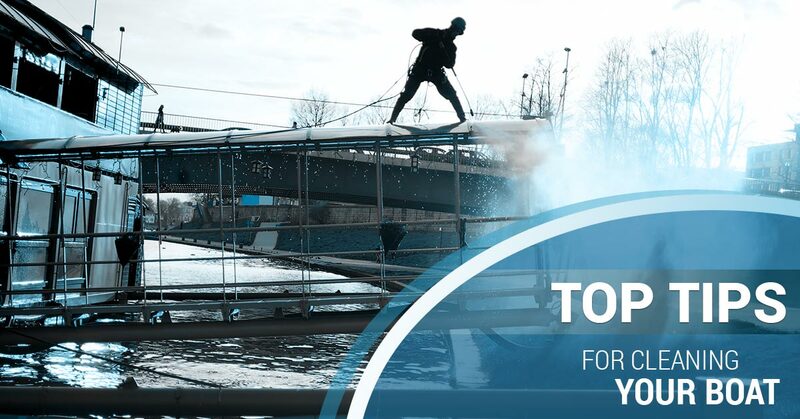 Use a power washer or garden hose to spray down the surface, from the bow to the stern. Doing so lifts up the mess from the fibers. Pro tip: If you own a wet/dry vac, use it to suction the dirt and water. Take care of the livewells – Smelly and grimy livewells are no fun to clean. Should you skip them as you clean, though, it’s only going to become even more of a breeding ground for worse stains. Begin by removing the filter screens from the livewell and the intake. A spray of clean water should free these from any clogs or deposits. In terms of the interior, the combination of baking soda and water can work wonders. You should quickly notice clean scum lines as well! Give the boat hull some attention – Stains and discolorations can do quite the number on a boat hull. First, wash over the entire hull before applying a cleaner with a sponge or soft scrub brush. To ensure UV protection, don’t forget to add some sort of gelcoat. There are countless products that do a great job but opt for one that doesn’t contain harsh chemicals or abrasive agents. Spray down the outboard boat engine – Over time, it can get grimy from oil residue and watermarks. Use a power washer to get the outside of the motor, then clean it well with dish soap and a brush. If you notice tough spots on the engine, a commercial degreaser should do the trick. Don’t forget about the boat trailer – You’ve probably noticed that your boat trailer is grimy in more ways than one. Feel free to spray down all exterior surfaces with a high-pressure spray. You may want to give extra attention to wheel wells, bunks, trailer tires, and wheels. Ready to put the finishing touches on your boat? 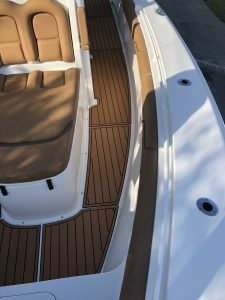 Marine decking could be just what you need. 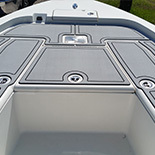 At Marine Customs, we can provide a simple, practical alternative to the traditional non-skid surfaces for boats, personal watercrafts, and more. 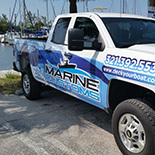 When it comes to boat decking, we are proud to be the experts in South Florida. Our team takes the time to understand your needs and develop a customized non slip decking solution. We never use a “one-size-fits-all” strategy for customers. Take your pick from a wide selection of colors and then let us handle a one-of-a-kind template. 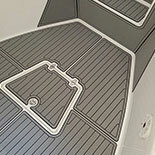 Upon request, we even do laser engraving to ensure our boat decking reflects your style/brand. Contact Marine Customs today to learn more about this SeaDek alternative.